Now a day role of women in the development of Society is admirable and day by day people are realizing the worth of women who are a part of our society and they too can participate equally. Madam Tanveer Junejo is also playing its role for society in a responsible way. 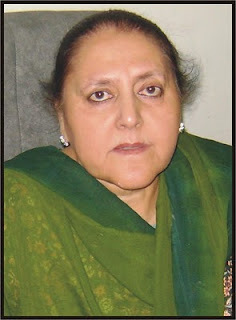 She was born on 6 Feb 1952 in a small town of Dadu district Pat Sharif. She got her early education from village and did M.A Sociology from University of Sindh Jamshoro in 1973. After that, she did her PhD from University of Sindh. During PhD her research topic was changing cultural patterns of Pakistan due to political situation as reflected in sindhi literature. Now she is serving as chairperson of department of Sociology in this mother institute and she contribute her many books on women rights in sindhi literature. Q: Why you select Sociology for your career? Ans: Actually I was keen interested to learn about society, its problems and the nature of human beings so I found myself as a social nature and I select this subject for my career and not just for my career but I was also want to bring some changes in society. As I belong to Interior Sindh and you know women of Sindh always live under the gloom of discrimination so this thing also convinces me towards Sociology. Q: What are the major problems of our society now a days? Ans: There are many problems in our society but every problem has its solution and these all problems not naturally gifted to us but we human beings are responsible for these problems. In our society, people don't have sense to realize the human values that's why these all differences has been created between communities. If we think like a simple human being and also understand the humanity then we could find real solution of these all kinds of Social problems. Q: What is the role of NGOs in development of Society? Ans: NGOs are playing very positive role and has proved beneficial for society because many social issues are properly handled by these social organizations. I am also the member of many NGOs and I realize that our literacy ratio is very low so people do not fully understand the working methodology of NGOs and they misunderstand positive role of NGOs. Q: What do you say about the Gender discrimination? Ans: In my opinion, what I have observed that gender discrimination has almost ended and females are also serving in society same like males and you know in all departments female have their quota and equal opportunities. But in rural areas of Sindh, this discrimination is still present and education is only way to overcome this problem. Q: What are your major achievements of your life? Ans: I have completed my parents dream because they wished that I get proper education and lead a successful life so being a female I have proved myself and working as a head of Department its big achievement of my life. Q: What developments you have made in your Department? Ans: When I was appointed as Chairperson, there was only single room for our department but now I have expand its building and few years before I also facilitated our students with computer lab having internet facility. Q: How many books you have contributed in your subject? Ans: I have contributed several books on sociology problems but among them two books are very much popular one is “Samaj Ja Usool” and second one is Aurat Samaj Aein Dadh”. These books are helping people to understand the Society and women rights. Q: Any message or suggestion for students? Ans: I suggest to all students that feel responsibility as a member of society and be sincere with yourself and your parents because this thing will make your life successful.